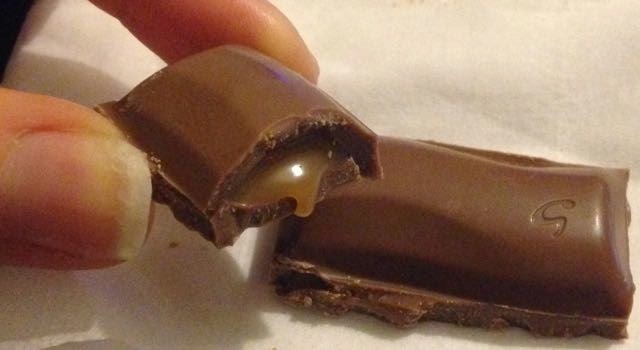 This new bar from Galaxy shows us that they are following the trend of salted caramel. To be honest they are a little slow on the uptake, but perhaps that is because they already have a Galaxy Caramel bar and they thought that was enough? It should be enough. According to the packet this is part of their "Caramel Collection" so perhaps there is more they can stretch out of the whole idea - "Caramel with a Hint of Butterscotch" will probably follow shortly. I know I'm being facetious but in the world of blogging about new chocolates / snack there is only so many "new" caramel variations a girl can take. So back to this bar, the new packaging has a hint of turquoise to distinguish it from its regular caramel sister product. Once opened the pieces look much the same as the regular bar too. I like the look of the Galaxy, the pieces are neatly curved. I attempted to break once piece in half and discovered that the salted caramel inside was gooey and slightly dangerously runny. Taste wise it has to be said the smooth Galaxy chocolate can really take the addition of salt to the caramel. It was still sweet and had a good flavour, but the salt actually worked rather well. I do have a love hate relationship with caramel, I do love the flavour but I do hate the commonality of it. I crave different more than anything else. I enjoyed eating a couple of strips of this bar watching the tv and it was only when I had finished my portion I noticed that the salty taste lingered on the palette. It wasn't quite unpleasant but it was enough for me to have a sip of drink to wash it away. Usually when I've eaten chocolate I like the fact the sweet taste remains afterwards, so I guess that is where this bar fails more than anything else. It didn't taste too salty at the time but I just wasn't keen on the aftertaste. This doesn't sound too exciting, I hope the other new caramel varieties are better! 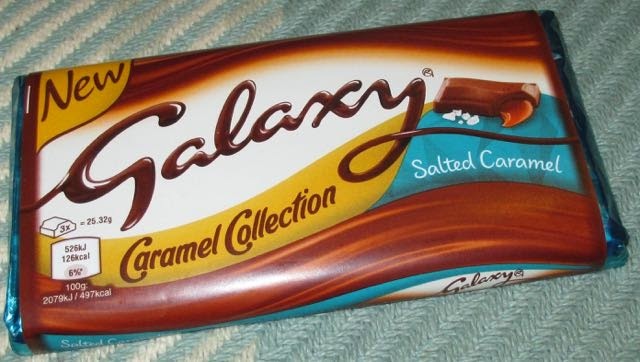 I just wish they would bring back Galaxy Liaison though, no-one does an 'everyday' praline bar nowadays.